Released as the fifth issue of a series honoring the spouses of the former Presidents of the United States was the 2008-W $10 Elizabeth Monroe First Spouse Gold Uncirculated Coin. This series of coins debuted in 2007 with a strike honoring Martha Washington, wife of the first President of the United States George Washington. Each coin in the series is struck from 1/2 ounce of 24-karat gold to either proof or uncirculated quality. Coins in the series are released at an approximate rate of four per year on a schedule tied with the release of the circulating Presidential $1 Coins. As indicated by the last two strikes released for the year, an image of Liberty is used on the spouse coins when the former President served without a spouse. This was the case with Andrew Jackson and Martin Van Buren. 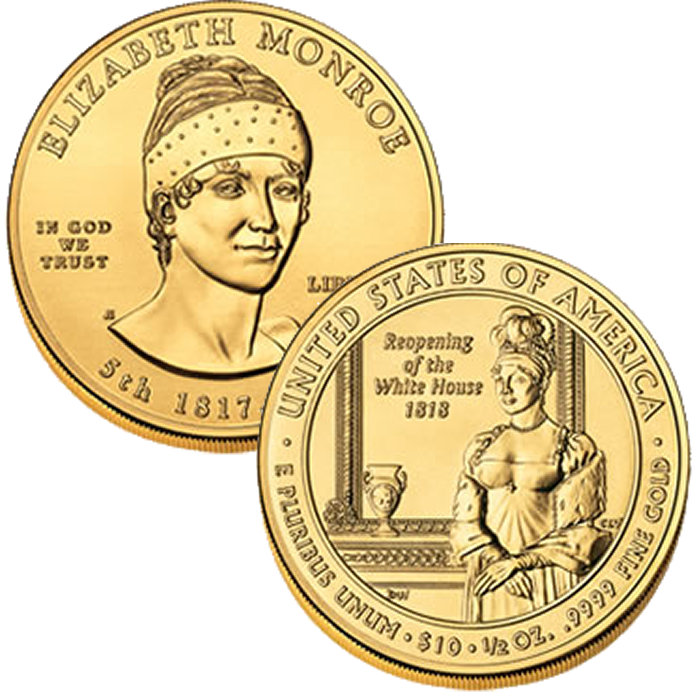 The US Mint released the Elizabeth Monroe coins on February 8, 2008. 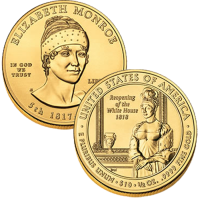 Initial price on the Elizabeth Monroe Proof Coin was $599.95. Designed by Susan Gamble and sculpted by Don Everhart, the obverse (heads side) shows a portrait of Elizabeth Monroe. Donna Weaver designed the image found on the reverse (tails side) of the coin and it was sculpted by Charles Vickers. It shows Elizabeth Monroe at a reception celebrating the re-opening of the White House after being burned by British troops during the War of 1812.